Caprese salad is all about ingredients. You are not cooking anything, but just arrange tomatoes, mozzarella and pesto sauce on a platter and season them. That's why, for me it is not really worth making unless I have tomatoes and mozzarella, which I would love to eat just on their own. I used to slice both mozzarella and tomatoes into circles before I first tried mozzarella di bufala. The thing about it is that the ball is chewy outside, but creamy within. Because of that the best way to cut this cheese is into segments, not circles. As soon as I got this, I started cutting the tomatoes in the same manner. In Moscow, the tomatoes I do like to eat just on their own are available June to early September, from farmers markets. Any tomatoes that are ripe, soft and intense in flavor are fine. I do prefer making my own pesto sauce, because nothing tastes like fresh pesto you just blended. There is nothing complicated about this - you just process some green basil, pine nuts, parmesan, garlic and olive oil together (detailed recipe here). However if you have a ready made pesto brand you really like, you can definitely use it here. If above all that Caprese is properly served, it turns into a real feast. 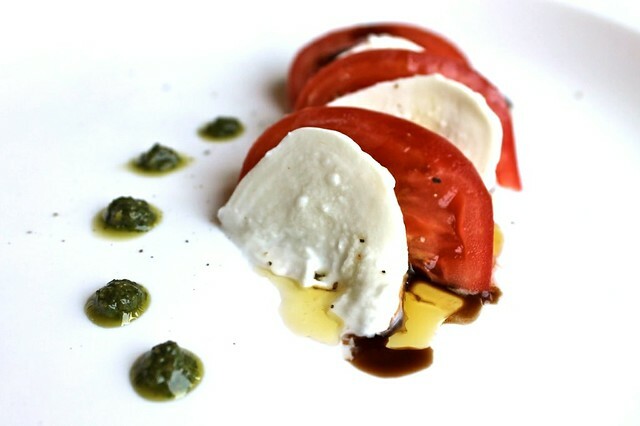 Complement your tomatoes, mozzarella and pesto with some good sea salt, good olive oil, good balsamic vinegar, some freshly ground black pepper, a few pine nuts and some green basil leaves. How can that not be good? Cut the tomatos and mozzarella into segments around 1.5 cm thick. Arrange them on the serving dish the way you prefer. I like the classic way when you alter the slices of tomatoes with mozzarella and arrange them in a semicircle. Complement the salad by the pesto the way you prefer (e.g. serve it in a separate sauce cup, spoon it over the tomatoes or pour it onto the dish). Drizzle with olive oil and balsamic vinegar. Sprinkle with salt and freshly ground pepper. Add the nuts and basil leaves (if using). In an ideal world, get yourself a glass of nice white wine and enjoy. I love using the pesto for salad dressing. First time here ... following you ..Your blog is simply superb..Do visit my blog when time permits and hope you will follow me too !! can you tell me please, which are your favourite markets? hi Ani, are you still in Moscow?